“What are you giving up for Lent?” we are asked. Our minds begin to whirl: Chocolate? Designer coffee? Social media? Forty days later, some feel disappointed in their efforts (it was a limited-time blend . . . ), some feel surprised by their success (didn’t even miss it . . . ), but perhaps precious few feel spiritually renewed. Can such fasts alone truly prepare us to celebrate Easter? Or any other chosen time of reflection during the year? Or could it be that before we can be duly awed by resurrection, we need to daily honor crucifixion? 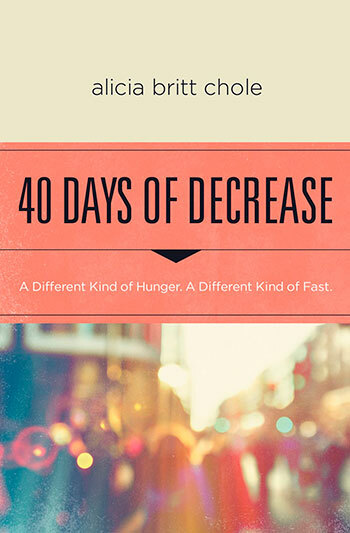 40 Days of Decrease emphasizes a different type of fast. What if you or your church fasted comparison? What if your family fasted accumulation? What if your office fasted gossip? a sidebar into the historical development of Lent. Alicia Britt Chole is an international speaker, an author of a dozen books and Bible studies, a seasoned mentor, and the founding director of Leadership Investment Intensives, a nonprofit devoted to providing personal soul-care to leaders in the marketplace and church. Her book, Anonymous: Jesus' Hidden Years and Yours, is highly regarded by leaders and learners around the globe. Alicia and her husband of 25 years joyfully parent their three extraordinary children in a country home off of a dirt road surrounded by loads of laundry, laughter, and love.